The Adventist Youth Emblem was designed by Elder John H. Hancock in 1980. Elder Hancock, put himself through academy and college by drawing company logos and cartoons for newspapers. 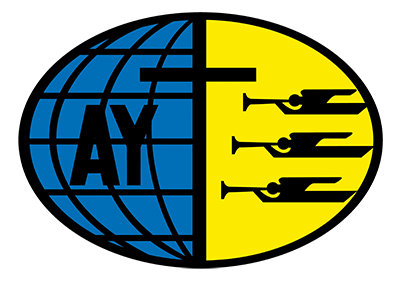 John designed almost all the AY Honors since from 1960 to 1980. An interesting story (which makes being a Youth Ministry Historian such fun), when the design was first voted Elder Hancock sent a quick letter (no cell phones or e-mail in use at that time) saying “hold it guys, we need to flip the design”. It seems that the original design had the cross and then AY which appeared to be TAY. With the design flipped it appeared as we see it today AY and a cross – signifying Adventist Youth are loyal to Jesus Christ. Elder Hancock’s letter will be on file at the Adventist Youth Ministries Museum. In Spanish and Portuguese the same emblem is used with JA signifying Jovenes Adventista - Adventist Youth.